Mission San Diego de Alcalá was founded July 16th 1769 by Father Junípero Serra. It was named for Didacus of Alcalá. This is the first mission of the twenty-one Spanish missions that today line the state of California. The Spanish expedition that founded Mission San Diego brought great hardship and an enormous loss of lives. The group of religious and military Spaniards finally succeeded in establishing the first of the three missions planned in Alta California to hold the northern frontier from advancing Russians. 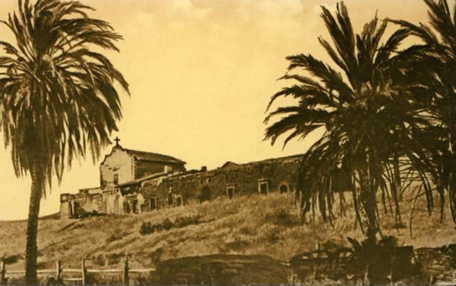 In 1774, after only five years from its foundation, the mission was moved from Presidio Hill to the present site near San Diego River because of the shortage of water supplies and the poor soil quality. Moreover, the new site was nearer the American Indian villages whom the missionaries intended to convert to Christianity. On November 4th, 1775, the mission was burned in an Indian attack and stormed onto the grounds. Father Luis Jayme, who perished in the attack, became the first Christian Martyr of California. His body is buried under the altar in the present church. By 1780 the first California mission had been rebuilt. In 1801 the mission was damaged by an earthquake. In 1833 the mission was secularized and sold in 1845. In 1862 it was returned to the church. In 1931 Mission San Diego was restored to the way it looks today. The front of the church is one of the simplest of all California missions. The attached wall, called a campanario, which rises above the mission gardens is impressive and one of the most beautiful of all missions.